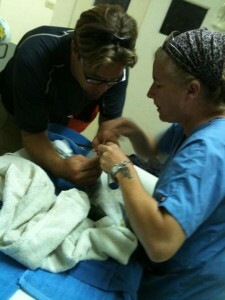 BWRC co-founders Dr. Isabelle Paquet-Durand and Justin Ford working on a wildlife patient. BWRC co-founder Dr. Isabelle Paquet-Durand started her career in Wildlife as a veterinary student/volunteer during the many years she spent in Central America and Europe. Over the past decade, her passion for Wildlife Medicine and Conservation has developed into a career as a Wildlife Vet, and Professor of Wildlife Medicine. BWRC co-founder Justin Ford provides the much needed behind the scenes support at BWRC and is the founder and Director of the Wildlife Institute. Both Isabelle and Justin have dedicated their careers to conservation and international development, with a focus on Wildlife and Ecological Management. Dr. Isabelle is an active member of the Belize Surgeon’s Veterinary Board, the Commonwealth Veterinary Association, and retains her veterinary credentials in Belize and Europe. Justin is an educator and a member of the IUCN Commission on Ecological Management. Both share a passion for conservation and education.